Channel 4 has confirmed that Big Brother is to be axed, but will run for one more year. Viewing figures of 2 million each night have not been enough to justify the £50m budget that will be better spent on challenging new programmes aimed at the youth market. Other channels may well take up Big Brother after BB11 ends next summer as Endemol owns the rights to the long running reality programme. Daily stories from Big Brother 10 can be read on robmacca's Big Brother Blog Squad website. BB10: POLL - Who Would You Evict Next? BB10: Day 81 - Sophie "I'll Nominate Marcus"
The Girls Aloud singer turned heads as she arrived at the Kings of Leon gig in Los Angeles wearing a see through black top without a bra. The 23 year old is about to launch her solo career that the press have billed as a head to head battle with Cheryl Cole. Nadine has been capturing the attention of record labels over in the States and has no shortage of offers. While it seems she may be short on bra's, Coyle knows how to work the media as she arrived at the LA Forum on Saturday night with her American footballer boyfriend Jason Bell. 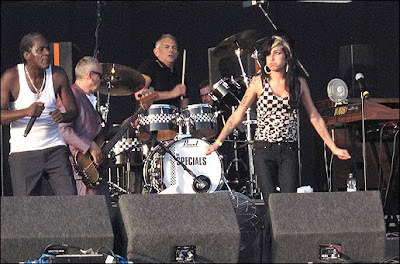 Above are some pictures of Amy Winehouse as she joined The Specials at V Festival for their final two tracks. Amy sang along to 'You're Wondering Now' and 'Ghost Town'. Looking very two-tone and healthy, she surprised the massive V Festival crowd. 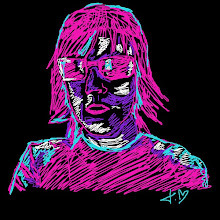 Later in the evening she took to the stage again with Pete Doherty, where they had a play fight and shared a kiss. 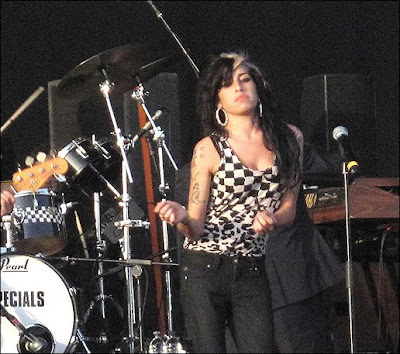 Amy Winehouse made her UK stage comeback with The Specials at V Festival with an appearance that NME.COM described as the 'most energetic performance of the day'. 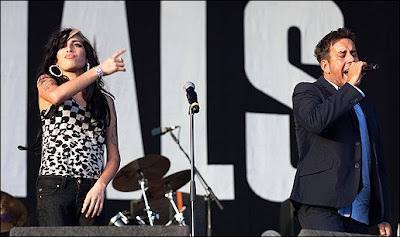 The surprise appearance of Amy Winehouse during 'You're Wondering Now' was greeted with cheers from the massive V Festival crowd. She looked well and waved happily at the crowd as she made her live comeback in the UK. 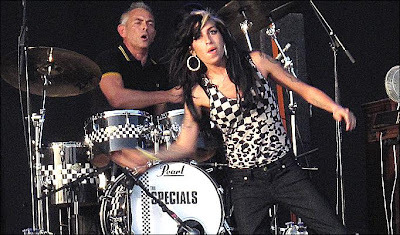 Amy stayed on stage for the final track 'Ghost Town', before encouraging the crowd to clap The Specials offstage in a performance that went down a storm with the festival crowd. Both The Specials and Amy Winehouse will be a memorable highlight from the festival weekend. 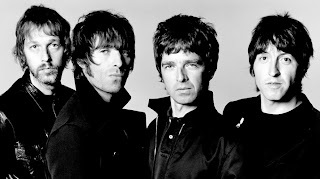 *Visit NME.COM for all the news on the V Festival. Lady GaGa Shows Off Her Bum Cheeks! Lady GaGa arrived at Heathrow Airport in London showing more than her passport, as captured on camera by Matrixphotos.com and published in the newspapers today. The 'cheeky' singer turned heads on her arrival with her revealing studded outfit. Lady GaGa was also wearing fans for added effects as she landed from Israel. It has been almost seven years since Whitney Houston gave her last full length interview, yet on September 14 she will be appearing on the new series of the Oprah Winfrey Show. 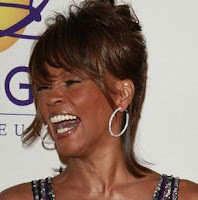 The interview has been billed as "the most anticipated music interview of the decade", according to Oprah's website as Whitney promotes her new album 'I Look To You'. Shania Twain has posted a video on her website thanking fans for their support over the past year. The multi-million country singer also told fans that she would be giving them a gift for her birthday on August 28. The singer has been out of the public eye since last May when the news that her marriage had ended as reported HERE. Since then details have revealed that Lange had an affair with Shania's former assistant and friend Marie-Anne Thiebaud but both Shania and Robert have remained silent on the subject. Shania has not released any new material since her 2002 album, Up! The Michael Jackson portrait by artist Andy Warhol has sold for $1 million (£606,428), according to reports. The 1984 painting of Jackson wearing his 'Thriller' jacket, which Warhol was commissioned to render for a TIME magazine cover, was auctioned off in New York, and was expected to fetch millions when bidding opened at $800,000. Although the portrait sold for $1m could have fetched a $10m (£6m) price tag, many may question why the Jackson portrait didn't sell for more since it is the work of Andy Warhol. Here are the Lady GaGa pictures from OUT magazine in all their glory, the photography was done by Ellen Von Unwerth and the styling by Nicola Formichetti. The pictures can be seen on the OUT website or better still you can see and read the full story when you buy a copy of OUT. Once again Lady GaGa proves she is the most innovative pop artist of the year as she blends music and art with fashion. Not afraid to push boundaries, something many readers of OUT do in their daily lives. Kerry Katona has been dropped by Iceland supermarket chain after media stories picturing her snorting white powder were printed. The News of the World had a video of the alleged incident on it's website and now the former Atomic kitten singer has been sacked from the £1/4m contract with Iceland. Maybe the spoof picture above will put a smile on a few readers faces - ALL COMMENTS WELCOME - let's have some fun with a humorous caption! Mel B has been the face of Ultimo underwear, a Spice Girl, the runner up on America's Dancing With The Stars and now Scary Spice is coming back to the UK as a presenter on ITV's Loose Women. The outspoken singer has never been one to shy away from expressing her feelings and producers think she will be the perfect choice for the lunchtime ITV show. Mel B is the latest Spice Girl to turn her hand too presenting, following in the footsteps of Emma Bunton, who is now presenting a radio show and Victoria Beckham who is about to appear on American Idol. George Michael was arrested following a collision with a lorry on suspicion of drink driving or drugs. The singer has only just got his licence back after a two year ban when he was found slumped behind the wheel of his vehicle and ordered to do community service. Police breathalysed the former Wham star at the roadside after yesterdays incident and George was detained for five hours before being released without charge. The accident occurred around 1am on the A34 near Newbury in Berkshire and the lorry driver said George Michael tried to climb into his cab window saying he was worried he would go to jail. 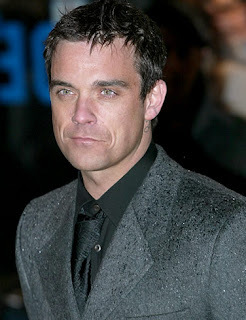 Robbie Williams will be appearing on the new series of X factor this autumn, and that has been confirmed by the man himself on his website. A statement read, "We're very excited to tell you that this is true." and the former Take That singer is expected to perform his new single 'Reality Killed The Video Star', ahead of it's release in November. Reports have suggested that Robbie Williams and Madonna will act as coaches during the new series of X Factor with further announcements set for release soon. Lily Allen is selling her watch but it's not eBay that she is using - it's Twitter. 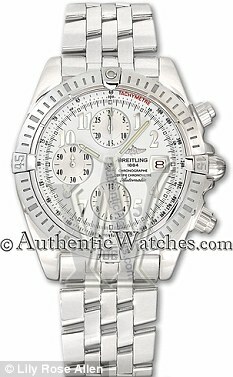 The singer is a huge fan of Twitter and decided to tweet that she was selling the watch for £3,200. Lily had bought the watch for almost £4,000 but found out it didn't fit. Rather than take the Swiss watch back (pictured below), Lily posted a message on her Twitter page saying, "I bought it for 4,4000 euros (£3,800) so I'd be making a loss." Nice one Lily! It's already been a hit in the United States and around Europe, now Lady GaGa has announced that 'Love Game' will be released in the UK. It will be the fifth song from the chart topping album 'The Fame' and is out on September 21, and is already in the iTunes Top 100. Lady GaGa is also set for a tour with Kanye West later this year that is, "going to be one of the most groundbreaking moments in touring history, I am sure of it." The Michael Jackson movie has been confirmed for release on 30th October after Sony Pictures paid a reported £36m for the rights to the exclusive rehearsal footage from AEG Live to make the movie This Is It. The film will be made up from the hours of rehearsal footage at the Staples Centre in Los Angeles. 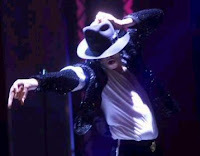 There will also be behind the scenes footage and interviews with those connected with Michael Jackson and proceeds will benefit the Michael Jackson Family Trust. 'V' the Sci-fi sensation from the early 1980's has been remade for a new generation and will be back on TV in America on ABC, starting November 3. Hopefully one of the UK TV stations will pick up the new version of 'V'. The new 'V' will focus on the first encounter with the seemingly friendly aliens, but in time the truth about the visitors is unmasked and their plan to steal the earths water exposed. 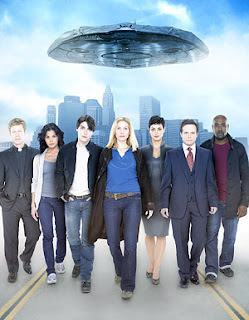 The cast features Lost's Elizabeth Mitchell as FBI counter terrorism agent Erica Evans with Logan Huffman playing her son Tyler. He sees the the prospect of world unity thanks to the visitors, which will cause tensions with his mum. Joining the line-up are Scott Wolf, Morena Baccarin, Joel Gretsch, Morris Chestnut, Lourdes Benedicto, and Laura Vandervoort. The show has been produced by Scott Peters, who worked on The 4400, Jeffrey Bell from Day Break and Alias, Steve Pearlman from Reunion and Jace Hall. 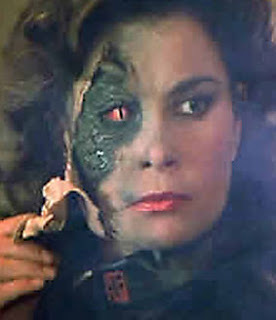 Fans of the original 'V' will need to give the new version time to prove itself as the original mini series back in 1983 was a ratings winner with 40% of viewers tuning in as the series unfolded and Diana was exposed. The programme came back with V: The Final Battle, a 1984 three-part miniseries; V: The Series, a 1984-1985 TV series; and V: The Second Generation, a 2008 novel by Kenneth Johnson. Johnson, who directed and wrote the original series is not connected with the new ABC version of 'V' and he is hoping to make a new 'V' film. Cheryl Cole has gone for the Sharon Osbourne look as she shows off her new red hair during a night out in London this week. The distinctive new colour is likely to make the Girls Aloud singer stand out even more from the crowd as she prepares for the new series of X Factor. Man From Swine Flu Ad Gets The Bug!